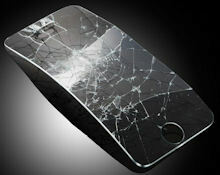 Apple has demonstrated the beauty and usefulness of tough glass surfaces for electronics devices. Yet even these more rugged screens still can be scratched and gouged by rough use, such as banging around in pockets and bags with keys and other nasty objects. So we still use cases for our devices to protect from bumps and falls (see earlier post), and add plastic film screen protectors to take the damage instead of the display. But films can develop bumps and bubbles, and can accumulate distracting scratches. So if glass was the right answer for the display, why not also use it for protection? This is the idea behind the SPIGEN SGP GLAS Screen Protectors. These are real glass, so they're fully transparent. The material is tempered glass, strong enough that sharp objects such as knives and keys do not cause scratches. And it has an oleophobic coating that prevents fingerprints and other dirt, and makes the surface easy to clean. The GLAS surface attaches to your device with a strong silicon adhesive on the back. The company does not recommend re-using it if it is removed. Beyond the base SPIGEN SGP GLAS.t line, the GLAS.tR line adds rounded edges to help deflect shocks from bumps and drops, anti-chip protection, and a tapered cutout for the iPhone home button. Plus the SLIM models are 28 percent simmer, only 0.4mm thick. The hope is that the GLAS surface will deflect or absorb the damage from an accident, instead of ruining your device with a dead display. If it is broken in a bad accident, it has an anti-shatter film to break into small pieces that are not sharp. GLAS surface protectors are available for devices including the Apple iPhone, iPad, and iPod, Google Nexus and Samsung Galaxy smartphones and tablets, HTC smartphones, and Amazon Kindle tablets. The iPhone GLAS.t is around $27.99 and the GLAS.tR is $34.99. Smartphones and tablets are great devices for bringing along your digital life, especially now that it's easier to share your media and files among your devices, so they are available anywhere. But these portable gadgets are not so helpful if you want to share stuff with other people, or directly among devices. We have technologies like USB connections and SD memory cards that have become ubiquitous global standards for PC interconnections and portable storage. But our portable devices (and particularly Apple idevices) do not participate as easily in these connections. One intriguing solution is to then leverage yet another standard -- Wi-Fi -- to connect our devices wirelessly, bridging PCs and portable and storage. We see this idea used by adding Wi-Fi to external hard drives like the Kingston Wi-Drive (see earlier post) and the Seagate Satellite mobile wireless storage (see earlier post), so you can connect to the drive as a wireless hotspot and browse and play its contents. Or, as a more general approach, a wireless router like the D-Link Shareport Go Portable Router (see earlier post) can add a USB connection in order to plug in any portable drive for remote access. Then there's another clever design, the Maxell AirStash wireless flash drive, which combines these three storage and connectivity standards in one device -- It's a USB flash drive, which uses expandable SD card storage, and connects to portable devices using Wi-Fi. There result is a fascinatingly flexible approach for expanding the storage of your portable devices and sharing media and files among multiple systems. To start with, the AirStash is a standard USB 2.0 thumb drive with a removable cap, so you can plug it in to your computer to read and write files as usual. And the SD card storage is "infinite". There's no fixed built in internal storage, so you can insert additional SD cards for whatever storage you need. You can swap cards to access more files, and load cards from other devices like cameras and camcorders to directly access newly-recorded media. Finally, the AirStash can act like a Wi-Fi hotspot, so you can connect to it directly and access files wirelessly. Just turn it on, go to your computer or portable device's Wi-Fi settings as usual, and select your AirStash device from the list. For example, you can store large photo or music collections and long videos on SD cards to view conveniently on your smartphone or tablet. In this way, you can build and share large collections (especially with video) that would clog up your on-device storage and would be painful to to sync directly or through the cloud. Even better, the Wi-Fi connection can be shared by up to eight devices at a time, so you can use the AirStash to share and exchange files simultaneously with a group of friends. Unfortunately, you can't use the Wi-Fi while the AirStash is plugged into a computer for file access, although you can connect wirelessly when it is plugged into a USB charger. The AirStash is a bit bigger than a mini USB drive, in order to accommodate the SD card reader and the Wi-Fi connection. But it's still highly pocketable and very light, at 3.6 x 1.2 x 0.5 inches and 1.4 ounces. The Maxell AirStash wireless flash drive is available for around $119 with an 8 GB SD card, or $139 with a 16 GB card. It's a great approach for general sharing of files, whether for your own collections or with others. See my holiday gadgets coverage -- Portable Accessories - Fall 2012 -- for more on portable devices and accessories. Entries posted to Manifest Tech Blog in April 2013, listed from oldest to newest.